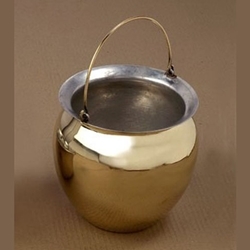 Roman Situla is a Roman cooking pot made from brass. Situla, from the Latin for bucket or pail, is a term for a variety of elaborate bucket-shaped vessels from the Iron Age to the Middle Ages, usually with a handle at the top. Situla is also the name for types of bucket-shaped Ancient Greek vases. It holds approximately one quart. It is made of brass, the interior is tinned.